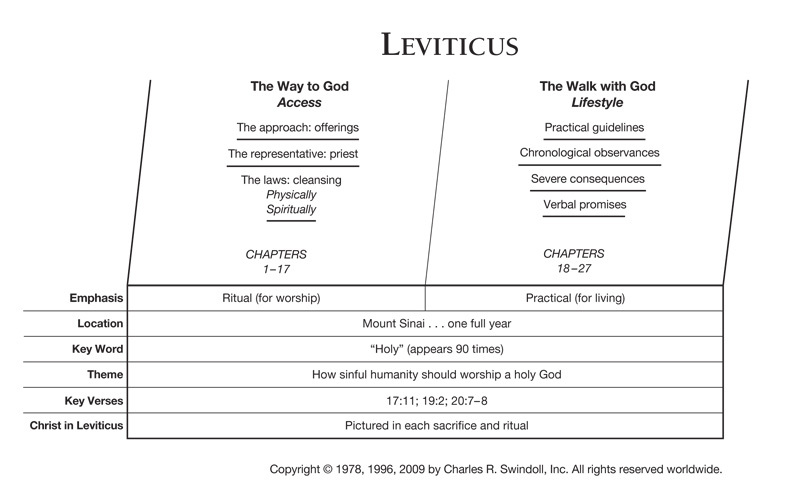 The content of Leviticus relates directly to Exodus, providing evidence that the same hand penned both books. The arguments that support Moses’ writing of Exodus also uphold Moses’ authorship of Leviticus. Additionally, we find more than fifty occasions when the text says something like, “The LORD spoke to Moses” (Leviticus 1:1; 4:1; 5:14; 6:1). The New Testament also refers to Moses as the author of passages from Leviticus (Matthew 8:4; Luke 2:22; Hebrews 8:5). The Law found in Leviticus was spoken by God to Moses at or near Mount Sinai, where the Israelites camped for some time. Because God delivered these detailed laws after the original Ten Commandments, the most probable date for their revelation is 1446 BC. Whether every law was written down at that time is impossible to determine; it may be that they were codified progressively during the ensuing 40-year wandering. “The book of Leviticus was the first book studied by a Jewish child; yet is often among the last books of the Bible to be studied by a Christian.”2 Today’s readers are often put off by the book’s lists of laws regarding diet, sacrifice, and social behaviour. But within these highly detailed directives we discover the holiness—the separateness, distinction, and utter “otherness”—of God. And we learn how sin devastates humanity’s relationship with their Creator. 1 Peter 1:15-16 references Leviticus 19:2 when it says: “like the Holy One who called you, be holy yourselves also in all your behavior; because it is written, ‘You shall be holy, for I am holy.’” Those who are redeemed by the mercies of God offer different sacrifices today; they offer themselves (Romans 12:1). Like He did with the Israelites, God has redeemed and consecrated Christians. Jesus offered Himself as the perfect sacrifice on our behalf, taking the punishment that we deserved so that we might be forgiven. Those who place their trust in Jesus’ atoning act become God’s children, saved by grace (Ephesians 2:8–9). 1. Raymond B. Dillard and Tremper Longman, III, An Introduction to the Old Testament (Grand Rapids: Zondervan, 1994), 73. 2. F. Duane Lindsey, "Leviticus," in The Bible Knowledge Commentary: Old Testament, ed. John F. Walvoord and Roy B. Zuck (Wheaton, Ill.: Victor Books, 1985), 163. Find resources in the book of Leviticus in our resource library.